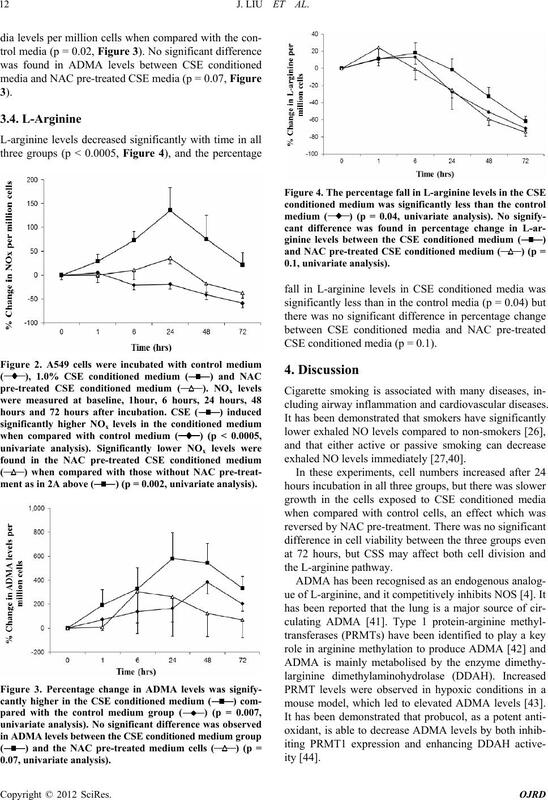 conditioned media compared with control media (p = 0.02) while NAC pre-treatment did not affect ADMA levels. 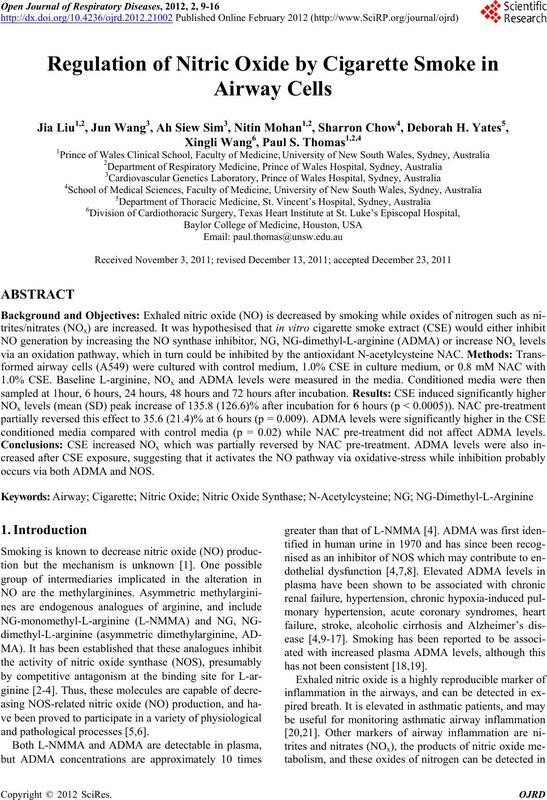 occurs via both ADMA and NOS. has not been consistent [18,19]. exhaled NO is reduced [24,26,27]. by the antioxidant, NAC (Figure 1). sis 2), which could be inhibited by the antioxidant, NAC. processing for the ADMA assay. 10AXL fluorescence detector (Shimadzu, Kyoto, Japan). tioned with 1mL 100% methanol and 1mL pH 7.0 PBS. sessed by Trypan Blue exclusion. pore, Carrigtwohill, Co. Cork, Ireland). and viability were counted at the time of sampling. Quantitative variables are expressed as mean +/– SE. each marker per million cells. control group (p = 0.009, Figure 2). No consistently detectable ADMA was present in CSE. ment as in 2A above () (p = 0.002, univariate analysis). CSE conditioned media (p = 0.1). cluding airway inflammation and cardiovascular diseases. exhaled NO levels immediately [27,40]. mouse model, which led to elevated ADMA levels . 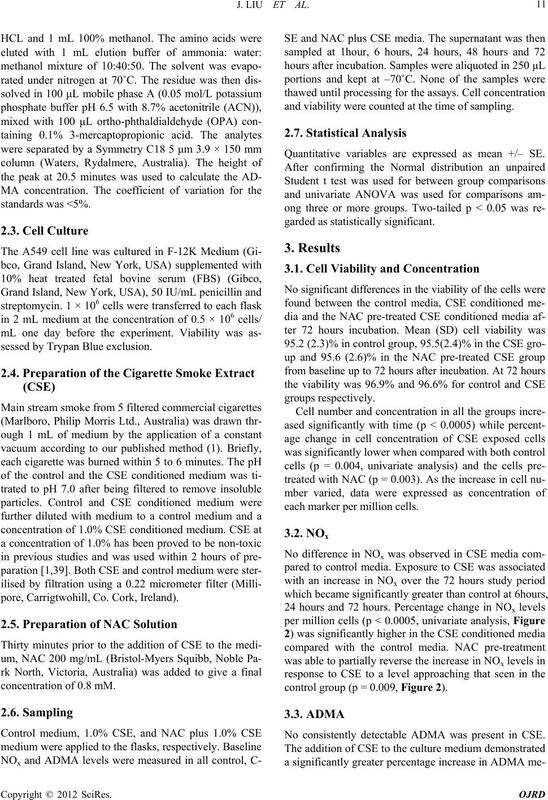 any contribution of CSE-donated NOx was negligible. also converted to L-ornithine via the arginase pathway. No studies have reported the effect of CSE on PRMT. to be converted to ADMA in the CSE exposed cells. sumed in the metabolism from L-arginine to L-ornithine. X. M. Wei, H. S. Kim, R. K. Kumar, G. J. Heywood, J. E.
No. 2, 1987, pp. 550-565. Vol. 339, No. 8793, 1992, pp. 572-575.
nine,” Nature, Vol. 333, No. 6174, 1988, pp. 664-666.
ogy, Vol. 20, No. 9, 2000, pp. 2032-2037. Human Urine,” Journal of Biological Chemistry, Vol. 245, No. 21, 1970, pp. 5751-5758. H. Matsuoka, S. Itoh, M. Kimoto, K. Kohno, O. Tamai, Y.
tal Hypertension,” Hypertension, Vol. 29, 1997, pp. L. J. Millatt, G. S. Whitely, D. Li, J. M. Leiper, H. M.
lation, Vol. 108, No. 12, 2003, pp. 1493-1498. 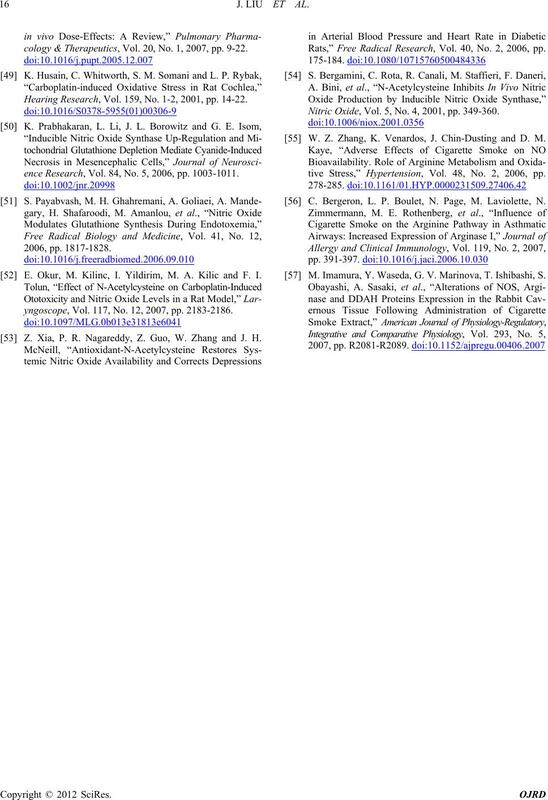 Q. Feng, X. Lu, A. J. Fortin, A. Pettersson, T. Hedner, R.
Failure,” Life Sciences, Vol. 62, No. 26, 1998, pp. V. P. Valkonen, J. Laakso, H. Paiva, T. Lehtimaki, T. A.
larginine (ADMA) and Risk of Acute Coronary Events. Atherosclerosis S upplem ents, Vol. 4, No. 4, 2003, pp. 19-22. No. 2, 2001, pp. 425-30. Alcoholic Cirrhosis,” Journal of Hepatology, Vol. 41, No. No. 7, 2003, pp. 903-907. H. M. Eid, H. Arnesen, E. M. Hjerkinn, T. Lyberg and I.
cet, Vol. 343, No. 8890, 1994, pp. 133-135. D. H. Yates, S. A. Kharitonov, R. A. Robbins, P. S.
cal Care Medicine, Vol. 152, No. 3, 1995, pp. 892-896. Medicine, Vol. 95, No. 8, 2001, pp. 649-654. Oxide, Vol. 8, No. 1, 2003, pp. 26-30. Smoke,” Thorax, Vol. 56, No. 6, 2001, pp. 456-461.
ogy, Vol. 9, 2004, p. A40. Care Medicine, Vol. 164, No. 6, 2001, pp. 1043-1046. Vol. 203, No. 1, 1994, pp. 209-218. Journal of Respiratory and Critical Care Medicine, Vol. Review, Vol. 5, No. 5, 2000, pp. 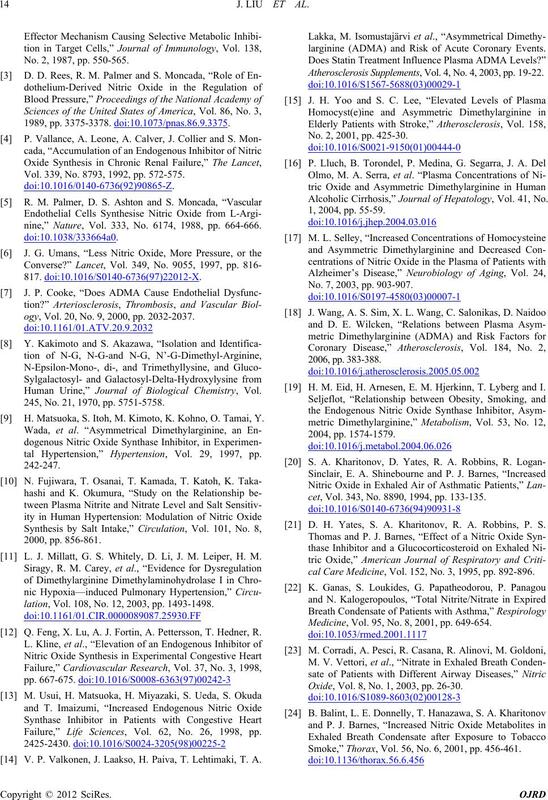 467-471.
of Cellular Biochemistry, Vol. 59, No. S22, 1995, pp. Alternative Medicine Review, Vol. 3, No. 2, 1998, pp. No. 3, 1986, pp. 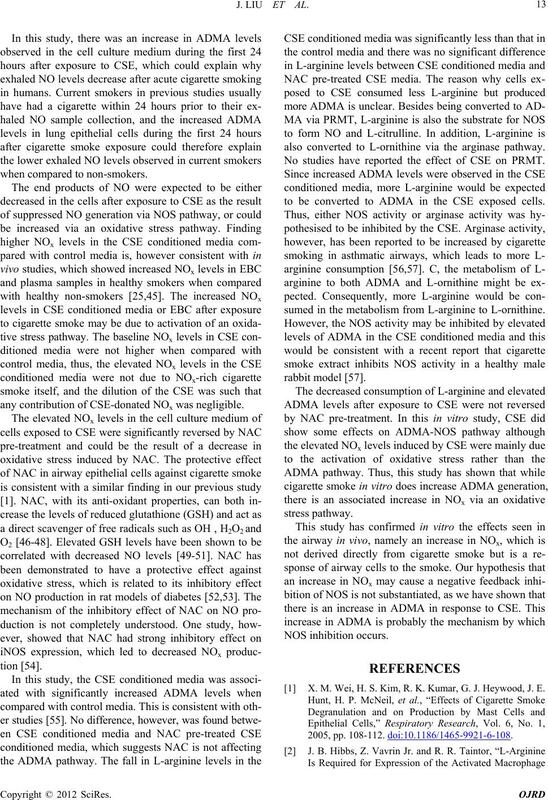 267-283.
posure of Rats to Cigarette Smoke,” Cancer Letters, Vol. 64, No. 2, 1992, pp. 123-131. Biochemistry, Vol. 214, No. 1, 1993, pp. 11-16.
istry, Vol. 303, No. 2, 2002, pp. 131-137. R. Schnabel, S. Blankenberg, E. Lubos, K. J. Lackner, H.
Vol. 97, No. 5, 2005, pp. e53-e59. can Journal of Physiology, Vol. 263, No. 1, 1992, pp. P. Bulau, D. Zakrzewicz, K. Kitowska, J. Leiper, A.
ology, Vol. 292, No. 1, 2007, pp. L18-L24. Chemistry, Vol. 243, No. 9, 1968, pp. 2108-2114.
apy, Vol. 20, No. 4, 2006, pp. 281-294. J. Liu, A. Sandrini, M. C. Thurston, D. H. Yates and P. S.
piration, Vol. 74, No. 6, 2007, pp. 617-623.
and Medicine, Vol. 6, No. 6, 1989, pp. 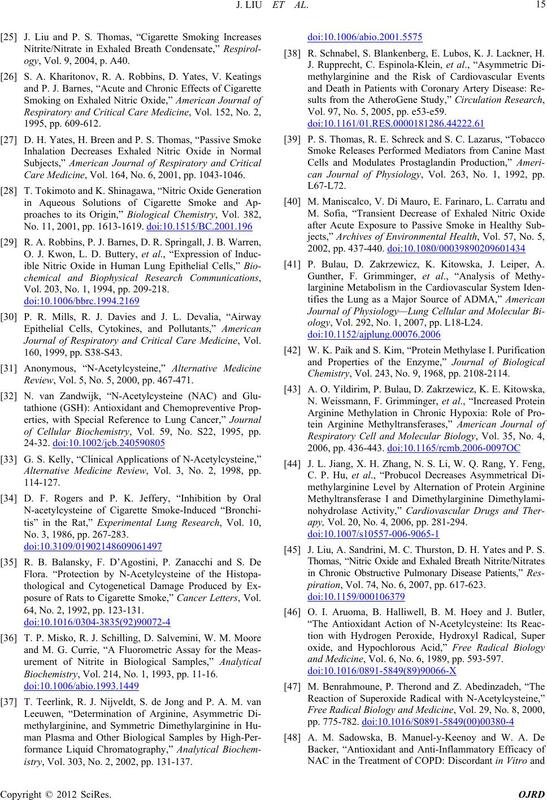 593-597.
cology & Therapeutics, Vol. 20, No. 1, 2007, pp. 9-22. Hearing Research, Vol. 159, No. 1-2, 2001, pp. 14-22.
ence Research, Vol. 84, No. 5, 2006, pp. 1003-1011. E. Okur, M. Kilinc, I. Yildirim, M. A. Kilic and F. I.
yngoscope, Vol. 117, No. 12, 2007, pp. 2183-2186. 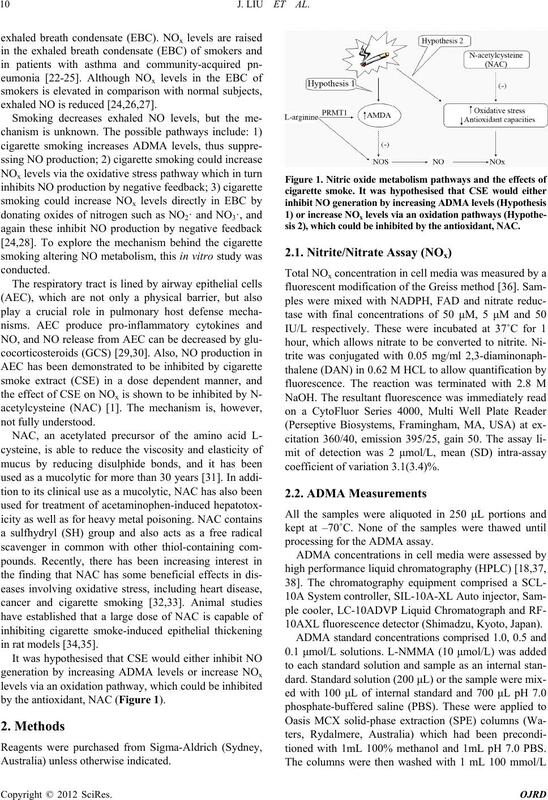 Z. Xia, P. R. Nagareddy, Z. Guo, W. Zhang and J. H.
Rats,” Free Radical Research, Vol. 40, No. 2, 2006, pp. Nitric Oxide, Vol. 5, No. 4, 2001, pp. 349-360. W. Z. Zhang, K. Venardos, J. Chin-Dusting and D. M.
tive Stress,” Hypertension, Vol. 48, No. 2, 2006, pp. C. Bergeron, L. P. Boulet, N. Page, M. Laviolette, N.
 M. Imamura, Y. Waseda, G. V. Marinova, T. Ishibashi, S.